Find your fast and professional grease trap repair and clogged drain cleaning services in Fort Pierce and Port St. Lucie, Fl by calling KRK Enterprises, Inc. We have been serving the great state of Florida for more than 20 years and have built and reinforced a reputation on exceptional customer care through superior service, notable workmanship, and absolute dedication. Our installation and repair techniques are the best that the industry has to offer. Fully certified and constantly trained, we provide guaranteed inspections and maintenance services to every aspect of your drainage systems, grease traps, and drain fields. When you need high-quality clogged drain cleaning and grease trap repair services in Fort Pierce and Port St. Lucie, Fl you can rely on, call on KRK Enterprises, Inc.
No project is too big or too small for our expert technicians. Our team is comprised of experts committed to constantly improving their training and are fully certified in meeting – and exceeding in – the industry standards. 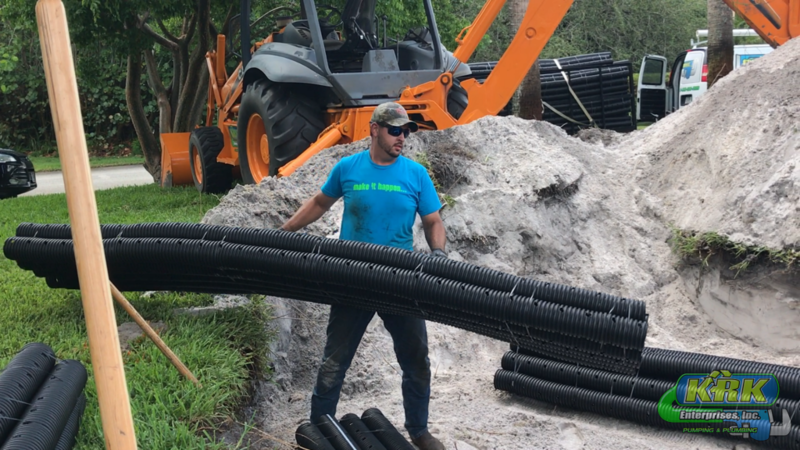 The health of the drainage systems of Fort Pierce and Port St. Lucie, Fl are vital to the daily progress of any business or private property. Our KRK team fully believes in offering the best service to every customer at affordable prices. When it comes to cleaning clogged drains, sewer line replacement and septic tank maintenance in Fort Pierce and Port St. Lucie, Fl, KRK takes on every kind of job you need a professional to complete. Never face a big obstacle alone – call in the experts who are armed with the tools, knowledge, and experience you can rely on. Our dedication produces high quality results at exceptional speeds. We get to work quickly and efficiently, meeting every challenge with a smile and absolute preparation. To learn more about your drain cleaning options, contact KRK through our online scheduling form or call us at 1-800-330-7686. KRK Enterprises, Inc. offers Fort Pierce and Port St. Lucie, Fl the best grease trap repair and clogged drain cleaning services in the region. We cover a wide array of projects from inspecting your backflow system to maintaining your septic tank. We know that a lift station has to be just as well taken care of as the field it is maintaining in turn. 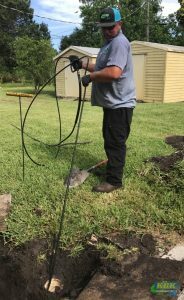 The passionate dedication with which our team carries out every job is enough to give you confidence from your first phone call that your sewer problems are in the right hands. Drain Field Services – We are available for quality drain field rejuvenation, maintenance, and inspections. Drain Field Repairs – Whether you need repairs or would like to update your drain field system, we are here to help! Septic Tank Services – Looking for repairs or maintenance for your septic tank? Call our plumbing professionals today! If you suspect an issue with your piping, septic tank, drainage, or grease traps, then call KRK today. We can begin the assessment to your suspected issue through our video camera inspection! The advantages in our use of advanced technology, like that of our vacuum trucks and camera videos, include finding your plumbing issue much quicker and can more immediately diagnose the problem and produce the solution. You, yourself, can even watch the entire camera video on DVD so that you may see the issue at hand for yourself. 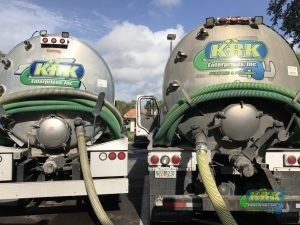 The grease trap repair and clogged drain cleaning experts in Fort Pierce and Port St. Lucie, Fl at KRK Enterprises, Inc. are one call away! Be informed from the beginning and trust in the experts you’ve selected from KRK Enterprises, Inc. Our Fort Pierce and Port St. Lucie, Fl expert clogged drain cleaning and grease trap repair services are available 24/7! This is what makes us your best and most honest choice for sewer repairs and more! Absolute Integrity: Our team of KRK experts maintains an exceptionally high level of honesty so that you know what services you are getting up front and for what prices. We never include hidden fees and we never proceed with a pricey repair that you do not know about. 24-Hour Emergency Service: Drain clogs, sewer backups, and grease trap overflows can happen any hour of the day or night. It’s hard to predict when a crisis may occur, and that is why we provide 24-hour services, 7 days a week. Our emergency repair services meet top grade standards when you need them most. Advanced Skills: Our KRK Enterprises, Inc. experts provide high-quality grease trap repair services and superior clogged drain cleaning services throughout the Fort Pierce and Port St. Lucie, Fl area. As your local licensed servicemen, we have been trained to meet local codes for every city and county as well as the installment requirements for each type of sewer, septic tank, grease interceptor, and general drain system. Advanced Technology: From our own maintenance and treatment products to our video camera inspections and vacuum truck, our use of technology is tailored toward providing our customers with the best possible experience. Our service technicians provide total transparency from start to finish so you know and trust precisely who you are working with and what they are doing to improve your drainage system. Serving the drain systems, grease traps, and draining fields of Fort Pierce and Port St. Lucie, Fl has been an adventure from the first time we began providing our dedicated services in 1985. Call us today to learn about what we can provide for you. If you don’t see your city listed above, don’t worry! These are just a few examples so you can see for yourself how far our expert services can reach! KRK Enterprises, Inc. gladly serves grease trap repair and clogged drain cleaning to Fort Pierce and Port St. Lucie, Fl and all of Florida. Learn more about our locations, services, or products, by calling us at 1-800-330-7686.